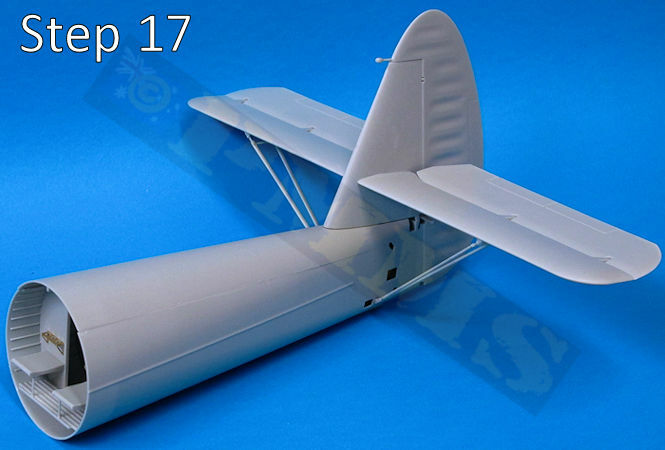 Part 2 of the review (part 1 here) is the kit build but as with most aircraft builds the model would normally be painted along the way for the interior and other sub-assemblies prior to final assembly for obvious reasons. As this build will on the kit assembly only I will leave the painting to builds best suited for that purpose and concentrate any issues or tips arising and to that end I have deviated from the normal assembly sequences in some instances so I can easily take some sub-assemblies apart later for final painting, this is mostly for the cockpit, main fuselage cabin and tail interior, the main wings and tail control surfaces and undercarriage are assembled as normal. I have used white glue on some assemblies for this purpose so some gaps may be evident that wouldn’t be there if glued normally, I will note this as we go along. I also used a soft felt pen to number the parts as they were removed from the sprues as some look similar but need to be positioned correctly. So with that in mind let’s move on and see how things go together, also remember there are four alternate layout options available as shown in the instructions. 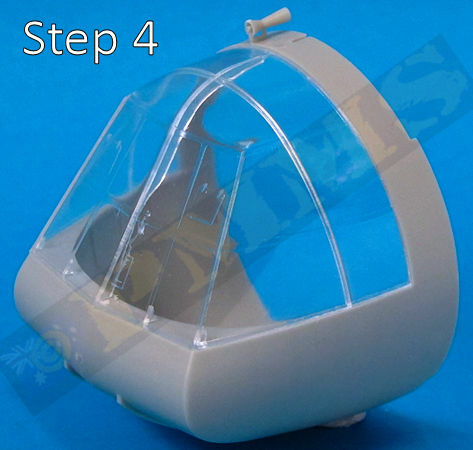 1; all closed up for flight, 2; with port and starboard troop doors open and troop seats fitted, 3; vehicle transport with the large port cargo door/ramp with wheel channels (seats removed) and 4; equipment delivery also with the port cargo door/ramp open (seats fitted) so you should decide the finishing option required before hand to use the appropriate parts. Also note that when configured for vehicle or large equipment delivery a few of the crew seats at the front and rear of the fuselage could still be fitted. 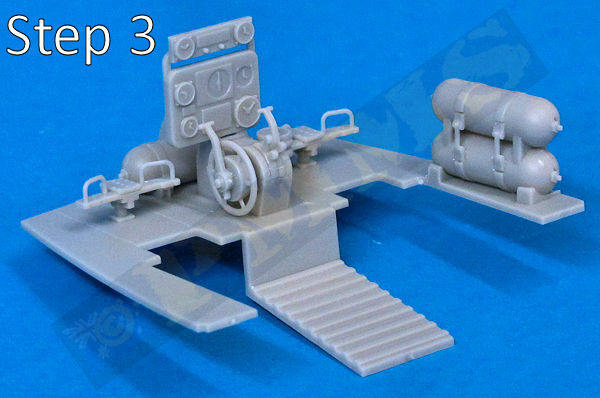 No additional equipment or stores is included with the kit but Bronco already have an impressive catalogue of Airborne subjects that could be used such as the Airborne Jeep (kit CB35169, CB35170), Airborne 6pdr A/T Gun (kit CB35168, CB35170), Airborne 75mm Pack Howitzer (kit CB35163), Figures (kit CB35177, CB35192) and Equipment (kit AB3567) so you can choose whatever load-out you wish for the kit. Assembly is quite straightforward, the large seat frames are added to the rear bulkhead along with the seat cushions, these have the moulded on belts but it would be easy to remove these to use aftermarket belts when available if you wish? The two control columns are added and can be set at any angle desired, just remember to set the tail control surfaces accordingly if you want to be particular, the very small wingnuts holding the control wheels in place add a nice touch but need care in handling. 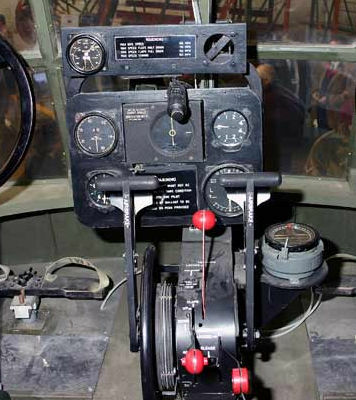 Image showing the port offset of the instrument panel on the central console and an image of a restored cockpit also showing the offset. 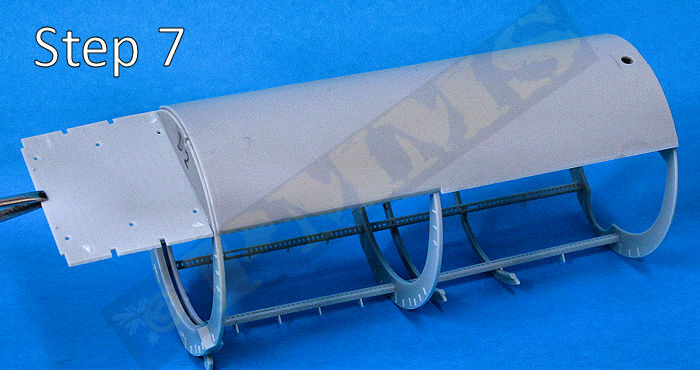 Note this image also shows the small panel light missing form the kit just above the central dial as well as the levers and other details. The assembled floor then fits between the seat frames for final cockpit assembly but there are a couple of items missing, the small switch panel (with switches and the fuse box) on the port sidewall as well as the battery box and signal cartridge stowage panel are also not included alongside the port pilot seat, these items can easily be made from thin plastic card to complete the cockpit layout. I glued the two cockpit halves (K1, K4) together and smoothed out the joins and added the clear glazing before fitting to the cockpit bulkhead, this made fitting the cockpit easier, you should note the inside central support frame on the clear glazing may need to be reduced in size to allow this to miss pressing against the instrument panel when fitted and test fitting before final gluing will determine if this is needed. Image showing the offset of the instrument panel on the central console. Cockpit added to fuselage bulkhead and then the outer skin and clear glazing is added. 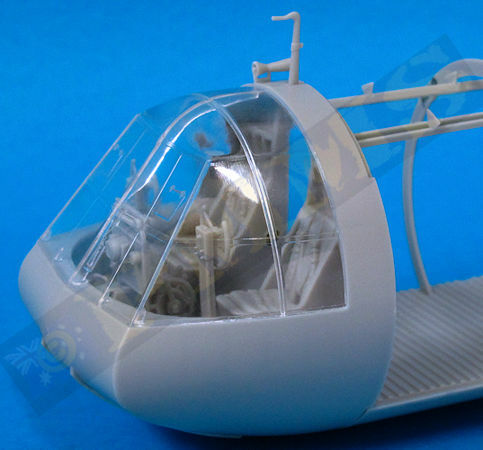 The main fuselage unlike most aircraft kits is a multi-part assembly with two inner floor sections, seven main bulkheads and three smaller ones, six outer fuselage skin sections plus the large cargo door and two smaller troop doors. It is essential for all the main components, floor, bulkheads and outer sections to be carefully aligned and with perfect fit as you go as any small miss-alignment can multiply as you move along, thankfully the fit of the parts is precise in most instances but there is scope for issues if not careful with each as you go and test fitting before gluing is a must. So with that all said assembly starts with the two relatively thin floor sections to which are added the individual bulkheads, the location of the bulkheads around the floor sections is good just make sure the fit to the underside of the floor is as snug as possible and the bulkheads are sit evenly and at perfect right angles to the floor as the glue dries. You must also open up the holes for the seats (if using them) in the front floor section (K13) using a 1mm drill bit, the holes in the rear floor section (C32) are already open so you don’t need to drill these. When fitting the bulkheads also make sure of the exact location as a couple are a little confusing in the instructions with arrows going all over but if you fully study the instructions and test fit there shouldn’t be any problems as they all fitted perfectly with my kit after following the above. After the bulkheads are attached and the glue dried you then fit the top stringers again paying careful attention at the location of the different part numbers, there are also small brackets (P5) added to the stringers and I found it easier to fit these and let the glue dry before fitting the stringers between the bulkheads. The fit was good overall but I did need to very slightly trim the stingers (P4) for the best fit and again test fitting will determine if this is needed. The rear floor section  is them attached to the lower fuselage section (B2) and the 80g metal weight added inside the forward lower fuselage section (N8) and this then glued to the underside of the front floor section  making sure when you glue the forward sections to the fuselage sections they are perfectly aligned centrally. The two floor sub-assemblies are then joined together and to aid in this the lower fuselage and floor sections overlap to provide a good positive central join. 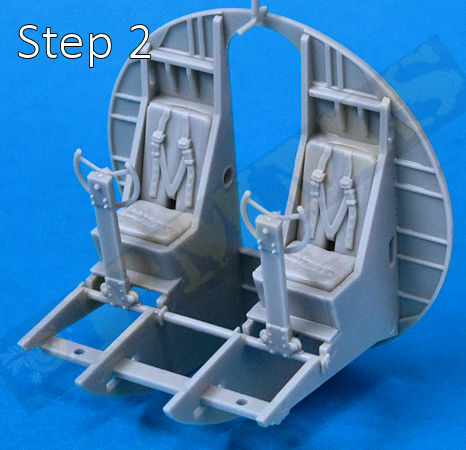 At this stage you must decide if fitting the seats or not depending on the final configuration of the kit, the seats have the bench with moulded on seat belts and separate perforated end mounting brackets as well as fixed legs that all go together without any problems and fit neatly in place along the cabin sides if being used. 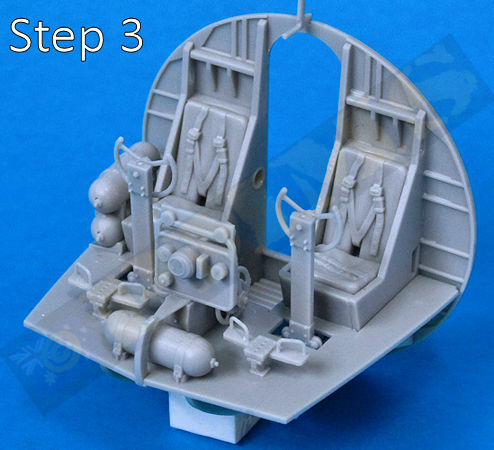 The instructions also show to fit the forward cockpit-sub-assembly at this stage and again the fit was very precise and snug. 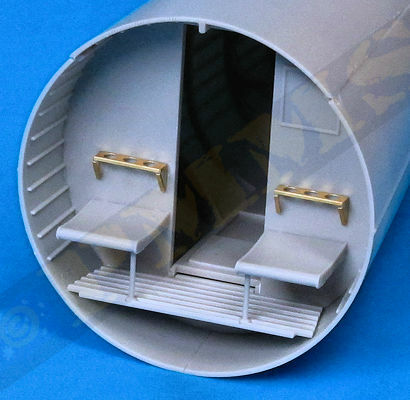 The large port side cargo door can be positioned open or closed with two alternate configurations if open, one with vehicle loading channels and the other for loading small cargo as well as the smaller troop door being separate and can be open if the main cargo door is closed. The cargo door has additional inner bulkheads for the smaller door opening and corrugated floor sections and it’s best to fit all of these while the glue is malleable to allow for small adjustments to get these all lines up and positioned correctly. 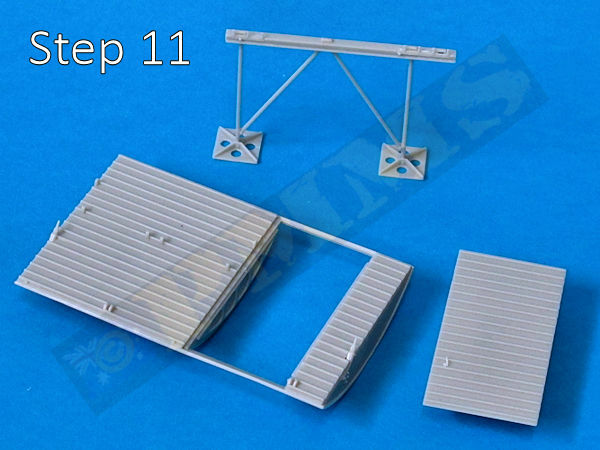 If using the vehicle loading option the large stand support for the door has the W legs with small feet and the top beam with additional channel clips and this assembly needs to be aligned as it is easy to have feet and a twist in orientation if not careful, so assemble and let the glue dry completely before fitting to the door proper. When fitting the stand to the door there are two small attachment brackets (P7) but I found these hindered the fit so I left these off and fitted them after the stand and door were glued together but as these are on the underside and hard to see it’s ok if a little out of position. 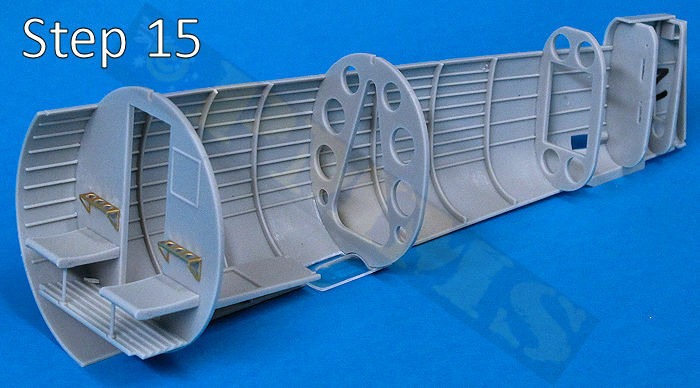 Support cables (thin thread may be used but not included in the kit) can be added from the brackets on the door (P8) leading to small holes in the fuselage bulkhead. Each of the fuselage side panel sections have additional port hole windows with separate square frames, the frames need to be held in place firmly until the glue dries for the best fit and care is needed when fitting the round windows as these have a slight curve in the “glass” so make sure you fit these with the curve correctly orientated, seems obvious but is easy to get wrong if not careful and again it’s best to fit the windows before attaching the panels to the fuselage. Fitting the fuselage side panels requires care to get each to fit as snugly as possible and again test fitting is best before gluing and fitting those along one side while the glue is still workable will also help to ‘fix’ any small gaps or miss-alignment that may result although I found the panels fitted very well considering the multiple parts involved. 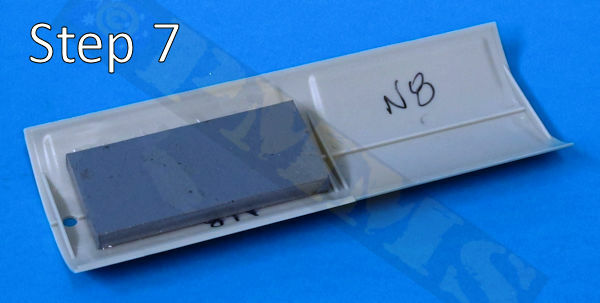 Note that the side panels fitted to the review build are only held in place with white glue allowing them to be removed later for painting so any small gaps showing in the images will be resolved when glued proper. 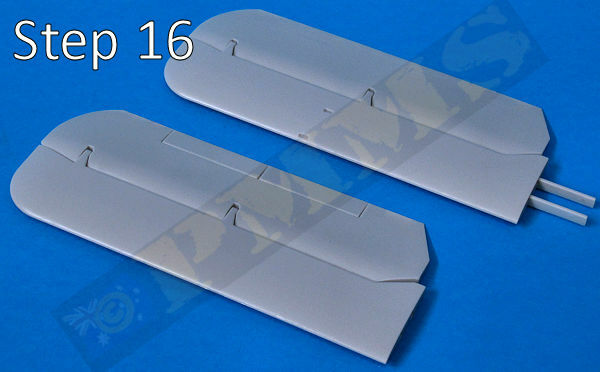 I did glue the central top panel (C11) securely in place to the cabin bulkheads as this is under the main wing and will help stabilize the assembly when fitting the wings; I also glued the rear top panel (C6) to the top wing section (B6) and not the fuselage but more on this later. Also note I have left the port side fuselage panels off to show the interior details but these would normally be attached the same as the starboard side panels at this stage of assembly. 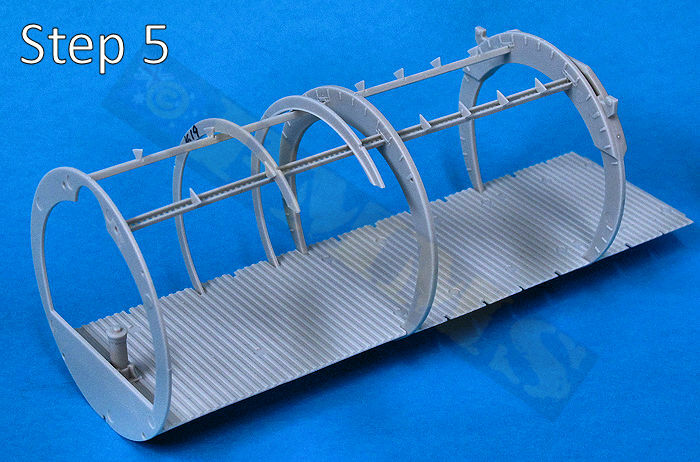 If building the model for vehicle or large equipment delivery you will need to get information regarding the tie down securing of the various loads from available references such as that shown at the bottom of the initial kit review. The nose wheel halves are glued together and the wheel trapped between the two part nose wheel leg, no problems here apart from the bulge effect on the nose wheel is huge and someone forgot the put air in these tyres for sure. 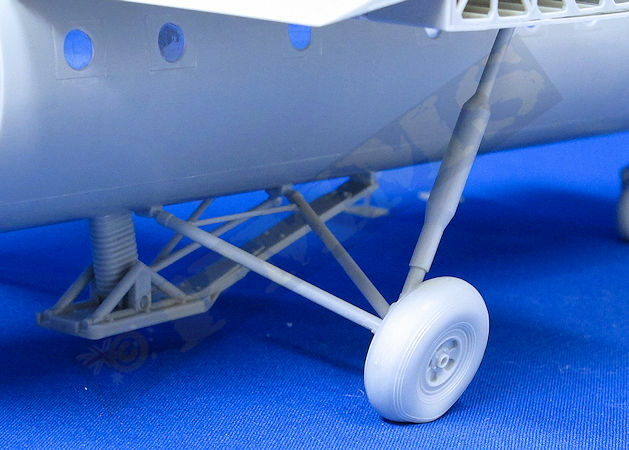 The large pin on the nose wheel leg ensures a strong and positive fit the underside of the front fuselage. 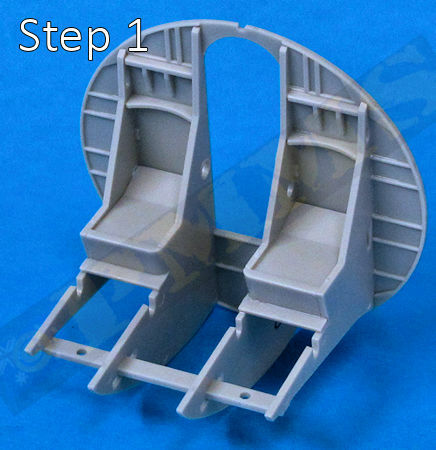 The landing skid is a robust assembly with a large locating lug thankfully which fits into the corresponding hole in the underside of the fuselage, when gluing the two spring sections (F1, F20) make sure the support arm (B1) is left unglued at this stage for fitting to the main undercarriage legs later. 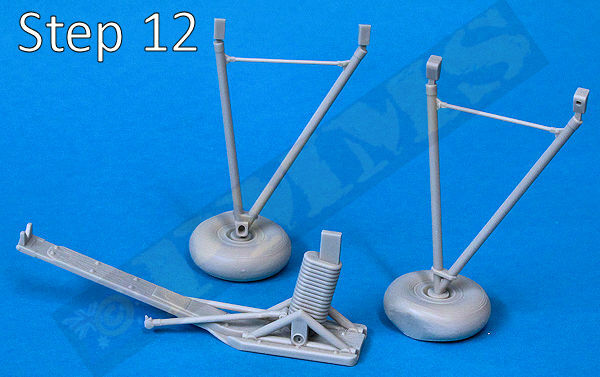 The main legs have large attachment blocks that fit into the underside holes and again make for a solid join, just make sure the blocks sit snugly into the holes so that both legs sit at the correct angle and the support arms from the skid are attached to the legs as you glue these in place. 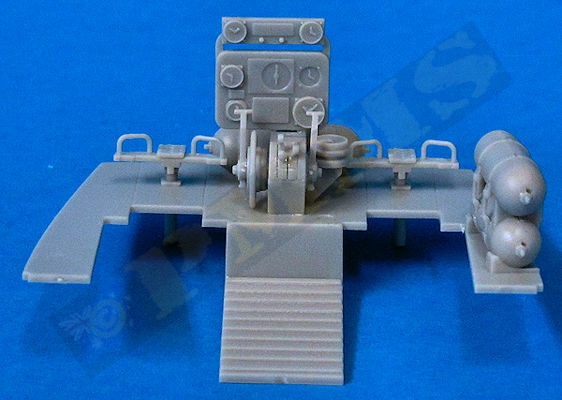 The main wheels again have substantial “bulging” effect added which looks a little excessive and oddly the underside of the bulging isn’t perfectly flat so when sitting on a flat surface the edges of the bulging are a little off the ground, but this can be remedied easily. The wheels are angled substantial which is correct so don’t worry if this looks a little odd. 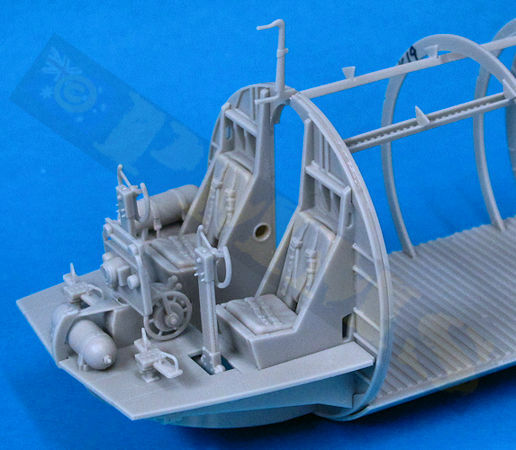 Also if displaying in a landing diorama the undercarriage would not be present having being jettisoned long before with the Horsa landing on its skid only. The tail section is split into three main parts, the two sides and top fuselage section with all three having inner stringer details as well as additional bulkheads and these fit snugly in place, when gluing the bulkheads into one of the side sections it’s good to attach the top panel (A2) to ensure the bulkheads sit at the correct angle and the opposite side panel is than attached with everything fitting without any problems. 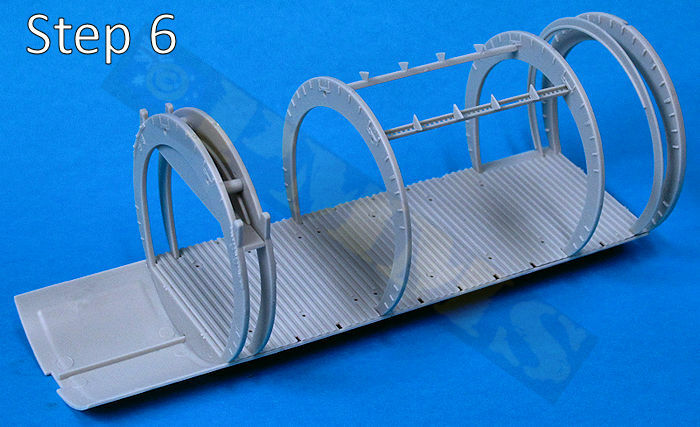 On the front door bulkhead there are two perforated brackets supplied in plastic and etched brass depending on your preference and if you building the model with the tail attached you can’t see these anyway so make the choice accordingly. The large rudder is in two halves and has some raised pin marks on the inside surfaces that will need to the be removed to allow the two halves to mate together properly, just note when fitting this to the tail there is nothing to hold it in place at the bottom to allow movement so is best to glue in the desired position. 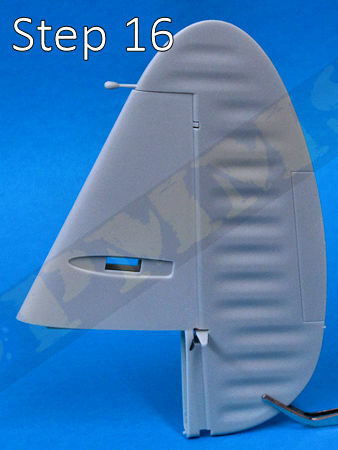 The tailplanes fit together without problems and the control surfaces are fitted together around the tailplane hinges to allow for elevation if you wish. 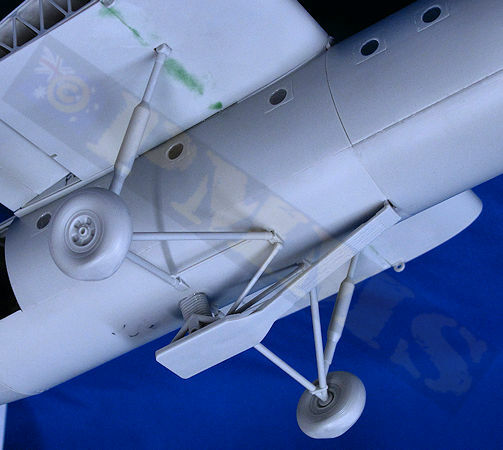 The assembled tailplanes glue through the tail and this sub-assembly is then fitted to the rear of the tail fuselage section again with a snug and robust fit with the two V support struts added to complete the assembly.